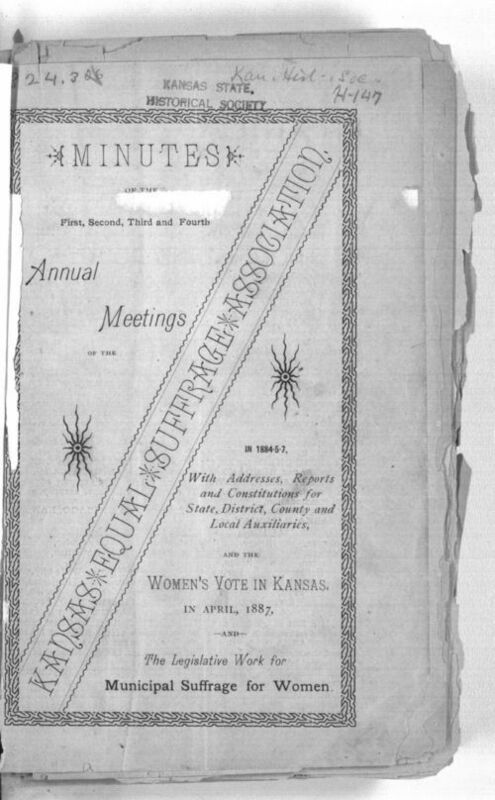 This pamphlet contains the minutes of the first four annual meetings of the Kansas Equal Rights Suffrage Association. The meetings were held in 1884 in Topeka, in 1885 in Salina, in 1886 in Topeka, and in 1887 in Newton. The minutes for the 4th annual meeting contain a paper presented to the convention by F. G. Adams titled "The Women's Vote in Kansas." Adams, who was secretary of the Kansas State Historical Society at the time, compiled information about Kansas women voting the elections of April 1887. The minutes for each annual meeting include details of the meeting, the speakers, and who attended. The publication includes information on suffrage activities in all parts of the state and on women working suffrage. This was an important period for women's suffrage in Kansas because the voters in Kansas amended the constitution to permit women to vote in municipal elections in 1886. People - Notable Kansans - Ellsworth, Bertha H.
People - Notable Kansans - Wait, Anna C.